Prehistoric humans found their way into the Ash Fork, Arizona, area and left behind pottery shards, arrowheads, and pictorial writings. Spanish conquistadors and fur trappers also passed near Ash Fork. After the Mexican-American War in 1848, Congress sent a number of exploration expeditions to the Southwest. Captain Lorenzo Sitgreaves and Lieutenant Amiel W. Whipple, United States Army Corps of Topographical Engineers, surveyed the 35th Parallel for a proposed railroad in this area. It was in the Ash Fork area that Edward Fitzgerald Beale as a member of the Army Corps of Topographical Engineers and a retired Navy Lieutenant experimented with twenty-two camels loaded with supplies and tools for himself and his road crew. Local mule skinners found the camels to be “foul-smelling, evil tempered, and ugly.” The camels trudged across northern Arizona while Beale’s crew cleared a ten-feet wide track to allow wagons to travel on the track. In 1881, construction began on the transcontinental railroad across Northern Arizona. A year later Ash Fork was founded with the arrival of the Atlantic and Pacific Railroad. Marshall Trimble, Arizona State Historian, wrote that the railroad built the line with a peavine of switchbacks and lazy loops which ran to Phoenix and the southern mainline and more kinks than a cheap lariat. Trimble grew up in Ash Fork during its golden years of the rails and Route 66. He began his career as an Arizona folk singer during the 1960’s, and today he is the official Arizona State Historian and the author of more than 20 books. 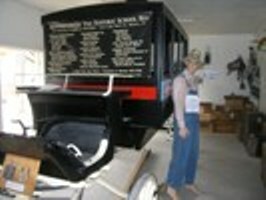 Trimble has taught Arizona history for more than thirty-five years and his letter sweater is one of the museum’s exhibits. The museum celebrates the railroad with train exhibits and the Fred Harvey restaurant, Escalante, which was built in 1907. The Escalante was one of the classic Fred Harvey hotels. The museum exhibit was constructed from old photographs and people’s memory of the hotel. Harvey’s meals were served with sumptuous portions that provided a good value for the traveling public and pies were cut into fourths, rather than the industry standard of sixths. The Harvey Company established a series of signals that allowed the dining room staff to feed an entire train in just thirty minutes. Harvey Houses served their meals on fine China and Irish linens. With the decline in train travel and the bypassing of the town by I-40 along with several disastrous fire in the business district the town went into decline. Ash Fork’s economy was helped when it became the Flagstone Capital of the World. Flagstone was quarried for the railroad to build bridges and private industry began shipping the stone for public buildings, churches and office buildings. The longest original, uninterrupted stretch of Route 66 still in existence, approximately ninety-two miles long, is between Ash Fork, Arizona, and Kingman, Arizona. Road. Route 66 boosted the town’s economy in the 1950’s, but construction of the divided highway through the town resulted in the destruction of many storefronts, sidewalks and residential streets. Part of the old Route 66 running directly through Ash Fork, is now known as Lewis Avenue. Outdoor exhibits at the museum include 1950’s Allis Chalmer Grader #284 donated by the Arizona Department of transportation, farm Equipment and a cultivator from Schucking Homestead, a dump hay rake from Schucking Homestead, a wagon frame from Schaeffer Ranch a fresno from Schaeffer Ranch donated by Roy Hume, a main water meter from the 1930’s donated by Ash Fork Water Service. The 1946 fire truck was donated by the volunteer Ash Fork Fire Department. Interior exhibits include Ash Fork building models which reflect the town and railroad life. 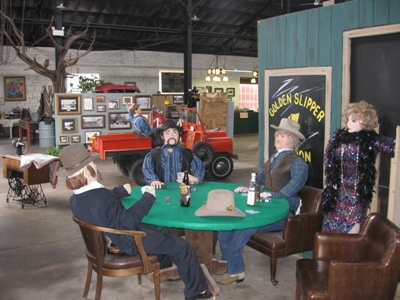 At the museum you can visit the Golden Slipper saloon and step into if only briefly, the Ash Fork jail. The Ash Fork School exhibit dates from the 1800’s to the new school in 1915. In 1959 a new high school was built.